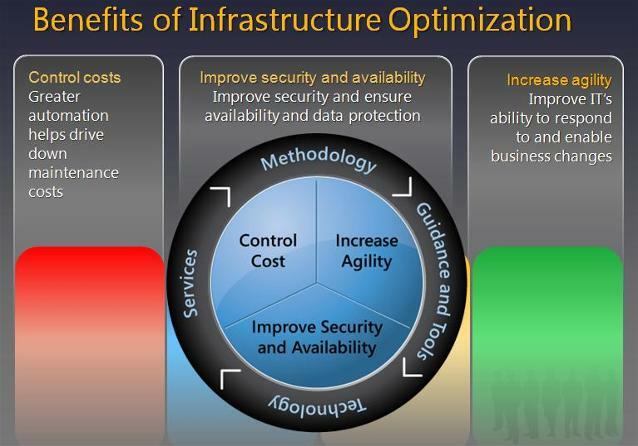 In late 2006 Microsoft developed the Infrastructure Optimization (IO) Framework to offer a gauge for your IT infrastructure and help plan infrastructure growth while realizing your considerable IT investment. Through our place as a Microsoft Partner we've been able to leverage and augment this framework to deliver full Infrastructure Optimization to our clients and thus deliver competitive advantage, meet your unique business requirements while saving money through reducing your Total Cost of Ownership (TCO). As companies grow, their IT infrastructures must grow with them, typically becoming more complex, more costly to maintain, and subject to continually increasing demands. There is often little alignment of the IT infrastructure with strategic business needs, making it difficult for companies to realize the full value of their technology investments. Through implementing the IO framework we are able to develop your IT function and realize its full potential. 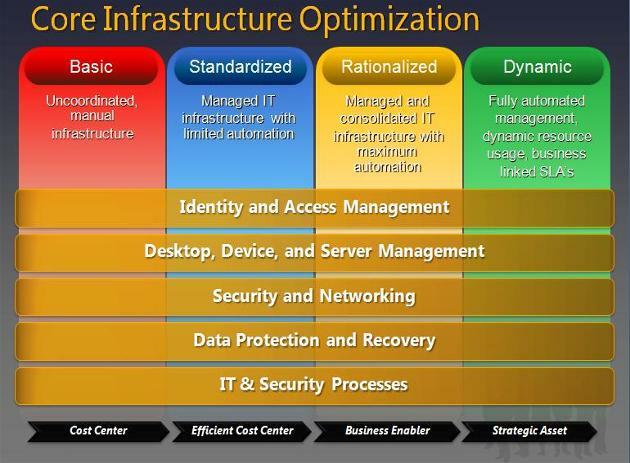 The Infrastructure Optimization Model defines four levels of maturity in the computing platform, each of which has specific and identifiable characteristics. After initially assessing your current level we work with you to introduce a standard and rationalized environment that will enable your IT function to become fully dynamic and continually meet the needs of the ever changing business marketplace. 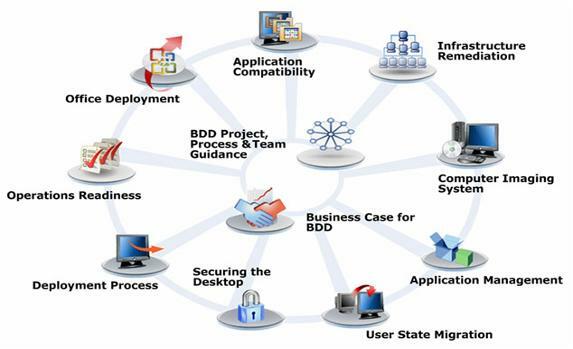 Recently, Microsoft announced their BDD (Business Desktop Deployment) framework (shown below), which we believe to be a leading collection of tools and services that can help apply best practice in end to end desktop management to most customers. This framework, when applied in conjunction with BMA Data's extensive desktop experience and tools, provides a world class service, designed to get results faster, with greater accuracy and at a reduced cost. Normally only engaged in medium to large enterprises the BDD framework and the newly released Microsoft Deployment Toolkit 2010 (which we are beta testing) is a set of unified tools and processes required for consistent desktop and server deployments. We've been able to augment BDD and deliver its benefits to smaller organizations. Small, medium and large businesses can now implement BDD as part of the BMA Data IO framework leading to reduced deployment times, standardized desktop and server images, improved security and ongoing improved configuration management and thus reduced support and management costs for our clients. At BMA Data we're able to take the BDD framework and modify it to the needs of any organization no matter what its size.